Tired of Default Training Methods? While there is plenty of default training, defined as “well, we have just always done it this way” … I pick on the absolute worst experience of them all: [important] training required by regulations. Attendees are already checked out and just rush through as quickly as possible, and knowing this, the designers just pump out content minimally meeting the requirements. The sad truth is that the underlying purpose is valuable, but it’s delivered so poorly that the value is lost. So when the training for such things comes up, we do need to know the requirements, but let’s not leave it at that. 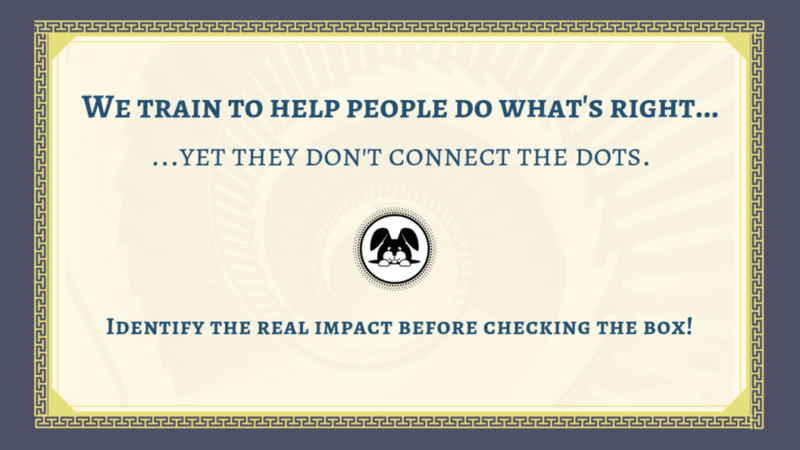 Ask the ESSENTIAL question: What impact do we want to see? Going back to mandatory sexual harassment training, a boring review of the rules results in the scenario I opened with, and nobody gains value. Instead we need to ask ourselves what will create awareness and safety to understand the impact to fellow people when sexual harassment occurs. Red flag icons for everybody’s desk? These drive the outcomes needed to have real impact, available to people when they need it. The next time you have information to share, stop yourself before dumping information on your poor recipient. Instead, 1) start with the behavioural effect, and 2) build an experience that helps achieve that.